While you may know about hybrid cloud, you may not realize that it’s more common than you think. 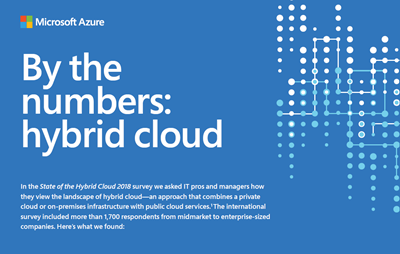 In the State of Hybrid Cloud 2018 survey conducted by Microsoft and Kantar TNS, 67 percent of respondents said they’re already using hybrid cloud or considering it for the future. Find out why companies like yours favor a hybrid cloud model and the use cases they find most important to their business. Download this infographic for a high-level overview of the survey and then watch a webinar to explore the full survey results.